Beth’s love of travel begin at a young age. Here first trip to Disney World was before the parks even opened, when her parents took the family to see the Preview center in 1970. She was hooked from that moment on. Her love for travel grew when several years later she had the opportunity to travel across the USA and found her passion. Beth has a degree in Accounting so she has an eye for detail. She later found the perfect opportunity to combine her passion for travel and her attention to detail to help others plan that perfect vacation and entered the Travel Industry. She loves the opportunity to help others plan their dream vacations. 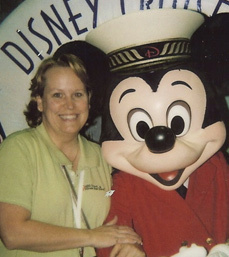 In addition to Disney, Beth has become a specialist with many other destination and resorts, including Cancun Specialist, Vegas Certified, Sandals Specialist, Universal Specialist, Palace Resort Specialist, Maui and Resort Quest Hawaii Specialist to name a few. Beth also loves cruising and has escorted cruise groups in the past. Beth feels very fortunate to have a wonderful husband and three children who share her passion for travel and are also more than willing to join her on any “research” trips to Disney or other Destinations. Beth loves the opportunity to share her excitement with her clients, whether it be their Honeymoon, Family Reunion, Girls Weekend, Families’ first visit to Disney or their 108th visit. Beth feels very fortunate to work with such amazing clients and loves making that dream vacation a reality.